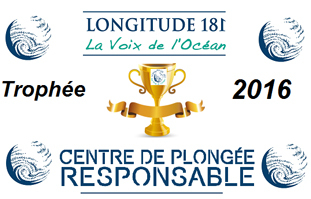 During the last Dive Show in Paris, Longitude 181 Nature honored Scubaqua Dive Center with the "Trophy of Eco Friendly Dive Center". 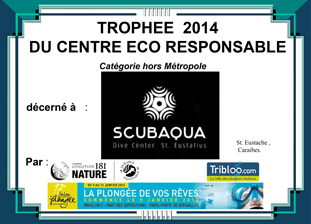 Scubaqua wins this prize for the second time and thanks all the people who voted and supported the projects which were presented for the competition. We collect and store rainwater to use for our rinse buckets, our toilets and showers at the dive center. The amount of water we collect covers about 80% of our needs. We installed drinking water fountains. We provide free fresh water to customers at the dive center and to divers on our boats in an effort to reduce the use of plastic bottles. We also use cups and straws made from recycled cardboard instead of plastic. We recycle glass bottles from our bar. In various ways we try to help our customers become more aware of waste management on Statia. For example, we suggest that when they leave they take whatever cannot be recycled on this small island. This includes such items as batteries. We continually try to educate our divers about responsible behavior (including good buoyancy control) to protect our fragile coral reefs (no anchoring allowed, one boat per dive site, etc. ).